Hitch Club is an all-new loyalty programme for GrabHitch drivers to get rewarded for driving. If you’re already a Hitch Driver, you’ll be automatically enrolled into Hitch Club – no opt-in is required. Simply do one ride to unlock the Rookie tier and start enjoying the benefits! If you’ve yet to be a Hitch Driver, sign up here to join us! Note that GrabCar driver-partners on GrabHitch platform will be capped at Rookie tier as there is another rewards system Emerald Circle, tailored for professional Grab drivers like you. Is there a subscription or membership fee? Nope! Hitch Club is completely FREE for all Hitch Drivers.. All you need to do is to complete a ride and unlock Rookie tier for you to start enjoying its benefits! A wide range of Hitch benefits (GrabHitch driving-related) and partner benefits (fuel, car and lifestyle) that complements your cost saving goals. Check out the benefits table here. How does Hitch Club work? Hitch Club operates on a points-based system that is reset every calendar quarter. Simply earn points within the quarter to reach higher tiers and unlock bigger, better benefits. Can I redeem my points? Not in the current version. Your points simply determine the tier that you are in and the respective benefits you’re entitled to. As such, you won’t lose any points or be downgraded to a lower tier during the quarter except in cases of refunds on previously completed bookings. Your points balance will be reset to zero at the start of a new quarter. How do I reach the next tier? You just have to earn enough points to meet the minimum requirement of the tier you aspire to reach within the quarter. There’s no limit to the number of times you can upgrade during the quarter so go ahead and move from a Rookie to a Champ! Will I lose my tier or be downgraded? It depends on how consistent you are. If you have achieved a particular tier this quarter, you’ll get to keep it till the end of the next quarter. For instance, if I earned enough points to become Champ by Q1, I will still be Champ for the entire duration of Q2 even without doing any rides. However, this also means that in Q3, due to my inactivity, I will be downgraded to be an inactive member, i.e. no benefits. I will then have to complete 1 ride to unlock Rookie and start climbing up the tiers again. Hence, to ensure I stay as Champ in Q3, I will have to earn the requisite points in Q2. Remember, your points balance at the end of a quarter determines your starting tier in the new quarter. How often are my tier and points refreshed? Currently, updates are on a weekly frequency – we’ll calculate your latest tier and points based on the previous week’s activity (Monday 00:00:00 to Sunday 23:59:59) every Monday. How do I check my latest tier and points balance? You may check your profile via your feed in the Grab app (passenger mode) every Monday 2pm (or next working day if Monday falls on a public holiday) for the latest update. Why can’t I track my progress in real time? If I have done a ride that qualifies me for the next tier, when will the upgrade take effect? Due to our weekly refresh, upgrading of tiers is not immediate and will only take effect on the next nearest Monday regardless of which day of the previous week was the qualifying ride completed. For instance, if I am 50 points short of becoming a Go-Getter and I do a ride on Wednesday which gives me 80 points, I will upgrade to Go-Getter on the following Monday, not on Wednesday itself. When will my new platform fee rate take effect? Since profile update happens every Monday, you’ll get to enjoy the new rate on the Monday which you’re upgraded to Pro or Champ as indicated on your profile shown in your Grab app feed, i.e. bookings with pickup time from Monday 00:00 will be charged at the reduced rate. What happens in cases of refunds or recharges of bookings from my previous tier? We will follow the platform fee rate which was relevant to your tier at the time of the booking, not the new tier that you are currently in. Are there any changes to the fee deduction process? How do I claim a no-show guarantee? No-shows must be reported within 24 hours from pickup time as indicated in the booking. Make sure you’ve not exceeded your monthly limit – once a month for Go-Getter/Pro and 3 times a month for Champ. Once verified, we will credit 50% of the original fare amount into your driver wallet within 5 working days. I was a Go-Getter and then upgraded to a Pro within the same month. Does this mean I get to claim my no-show guarantee twice this month? No-show guarantee between tiers are non-stackable. This means that if you’ve already claimed once in October as a Go-Getter, you cannot claim another no-show guarantee in same month even if you become a Pro. Likewise, if you’ve claimed once in October as a Pro and you move to Champ, you can claim twice more before the month ends. How does priority hotline work? Drivers in the Champ tier will be able to access the hotline via the Hitch Club profile in your Grab app feed. Please use your mobile number to call as the hotline is meant for your access only. Available 24/7, your call will be attended to faster than others! What is a feature testing session about? We’ll invite you down to try out a new feature prototype so that you can give us your feedback based on your experience as a Hitch Driver! We will notify you via email or SMS for you to indicate your interest. In case of overwhelming responses, we will shortlist participants randomly. From time to time, Grab organises coffee sessions, networking events and movie-screenings etc for our community to get together and meet each other. How much cash back will I be entitled to? Renew your motor insurance via the unique Hitch Club link to be eligible for the cash back dependent on your Hitch Club tier. If you are not in Hitch Club, complete 1 ride to unlock Rookie tier and start enjoying this offer from the following Monday onwards. I have questions regarding MSIG motor insurance, who should I contact? You may contact MSIG at 6827 2548 (Mon to Fri, 8.45am – 5.30pm) or email service@sg.msig-asia.com for enquiries. What are the car grooming options? Pest fumigation OR Air freshener. Steam cleaning to sanitize the car, killing germs, bacteria and micro-organisms such as mould and dust mites. For drivers who have paint damages, you are able to redeem or get a discount off it. Includes spray painting a panel (e.g. bumper corner etc). Excludes panel beating work on dent if required. Do I need to show any verification documents at KGC Workshop? Yes, show your Hitch Club profile via your feed in the Grab Passenger app to the staff at KGC Workshop for verification. What does the engine oil service package include? The Oil Service Package includes 4L Engine Oil, 1 Oil Filter (OEM), Reset engine oil change warning light, a 25-point car check and a complimentary Turtle Wax car wash. Full T&Cs apply. Do I need to make a pre-booking for the servicing package? Include “GrabHitch” in the Name field when you book your appointment (e.g. Andrew Tan GrabHitch). Book your appointment here. Do I need to make a pre-booking for the tyres? Yes, you will need to call Autobacs (tel: 6749 5600) to make a booking at least 2 working days in advance. Proceed to book your appointment here, and specify “Others” under “Services required”. Please also indicate your tyre size. Do I need to show any verification documents at Autobacs? Yes, show your Hitch Club profile via your feed in the Grab Passenger app to the Autobacs staff for verification. Do I need to show any verification documents at STAI? Yes, show your Hitch Club profile via your feed in the Grab Passenger app to the STAI staff for verification to enjoy 10% off car inspection service. Where can I find the link to the automotive collection? Browse the entire automotive collection here. Alternatively, you can find the link via your Hitch Club profile in the Grab Passenger app. Are there any offers for existing Shopee users? Opt in here to receive your promo code within 3 working days, and enjoy 15% off (capped at $4) items in Shopee. CardUp is an online card payments platform that enables its users to make payments with their credit cards, regardless of whether the recipient (merchant) accepts cards. This allows users to get credit card points / cash back / miles on payments that they typically have to pay cash with. Users can sign up for a CardUp account for free, and typically pay a 2.6% fee per transaction. More information here. 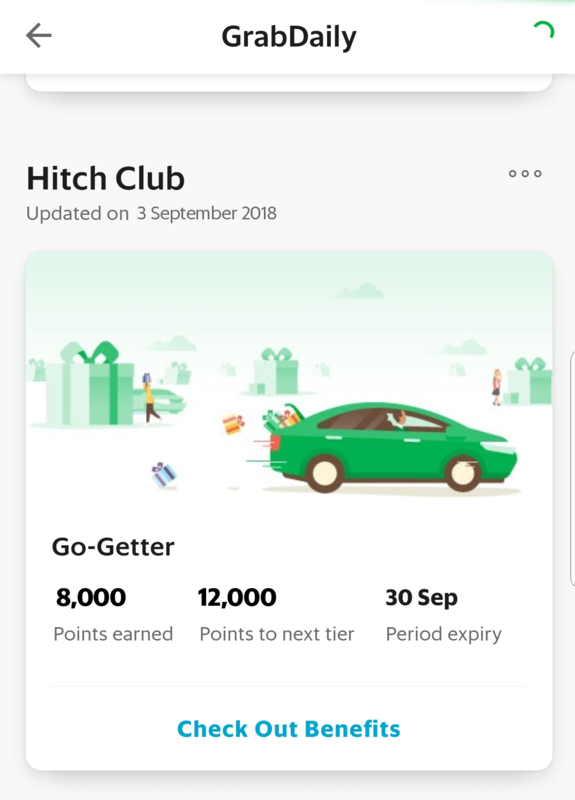 For new users, drivers pay 0% FEE on their 1st car loan or season parking payment using the promo code “HITCHCLUB” or 0.9% FEE on any other payment type using the promo code “HITCHCLUB99”. Full T&Cs apply. What if I am an existing user? Opt in here to receive your promo code within 5 working days, and enjoy 2.4% fee on unlimited transactions. Contact CardUp at hello@cardup.co with subject title “Hitch Club offer”. What are the exclusive telco plans with M1? Exclusively to Hitch Club Drivers in Go-Getter, Pro and Champ tier, enjoy 20% off telco plans, and free 3GB Data for selected plans with other value added services. All the bill plans can be found here. This is only eligible for new / re-contract lines, and not applicable to existing M1 subscribers who are still contracted to M1. Head to any M1 Shop or authorized distributors (full list here) to purchase / renew your plan with M1 (upon expiry of existing plan). Do I need to show any verification documents? Yes, show your Hitch Club profile via your feed in the Grab Passenger app and state “GrabCar Pte Ltd” for verification. Klook is an online platform for booking travel activities across Asia, including discounted attraction tickets, tours with unique experiences and more. For new Klook users, get $5 off your first booking on www.klook.com and Klook website Activities & Attractions mobile app. with the promo code “HITCH5”. Opt in here to receive your promo code within 3 working days, and enjoy additional 5% off any Klook activity, capped at $10, up to 3 times per Hitch Club member. Contact Klook at support@klook.com with subject title “Hitch Club offer”. Can I get more details about the GP Consultation? You can find details about the GP Consultation here. Can I get more details about the health screenings? You can find details about the basic and executive screening packages here. Can I get more details about the dental services? Do I need to show any verification documents at Healthway Medical/Dental? Yes, show your Hitch Club profile via your feed in the Grab Passenger app to the Healthway staff for verification to enjoy Hitch Club rates on all Healthway’s services.